An informal, cook-it-yourself fiesta in Little Tokyo. 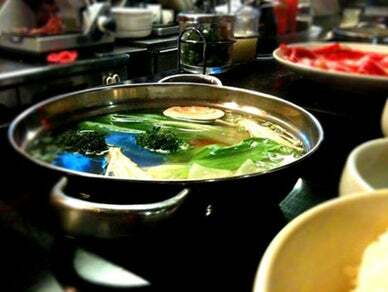 Its name refers to the pot of water that boils in front of you, to which you add raw vegetables and paper-thin slices of beef (which goes “shabu-shabu,” Japanese for “swish-swish,” in the water). Dip them one by one in ponzu or sesame sauce for a delicious experience. American Express: the go-to card for travel, restaurants, and experiences. Now accepted at more places than ever.